What is Paisalive and how much you an Earn? Paisalive allows to simply watch advertisements to earn paisalive income. Ads which you watch on your personal emails, social network, newspaper, television doesn’t paid you anything. But on the otherhand, Paisalive pays you to check advertisement’s promotion. Paisalive also pays you when you by login into your account daily. 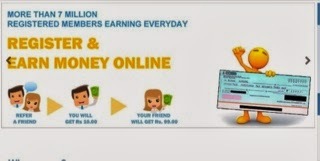 Paise live also pays you when you refer your friend to join. You will instantly get Rs. 99 in your account after creating your new account and you can earn ₹0.25 to ₹5.00 for checking each promotion. You can earn Rs. 2 for each friend you refer. You can’t become rich over night. Paisalive is also not a Multi-Level Mamarketing. You even don’t need to sell anything to earn from paisalive. You also don’t need to pay any fees to join paisalive. When you will be get paid? You will get paid 15th of every month by cheque. Addition to earn paisalive money, you must also watch 5 another Best ways of Earning Online if you really wants to earn online with legitimate ways.